First, let’s clarify what these are. This is a little confusing. 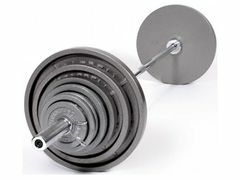 The word “standard” is also used for weight plates with 1″ holes, often used in cheaper weight sets but also for fixed-weight pro-style dumbbells and barbells and for cardio barbell group classes at many gyms. 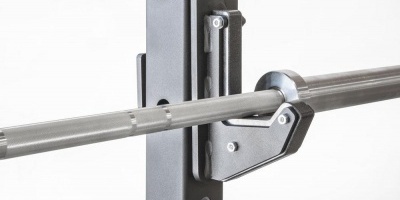 These plates have 2″ holes and are made to fit any and all olympic bars. With these plates the “standard” refers to the lettering on the plates. Just calling them standard plates would be misleading, so everybody has gotten to call them standard olympic plates. Chinese factories have been putting the “STANDARD” raised lettering on their lower end plates for years. Why stop now? At this point they’re everywhere and recognizable by so many of us that we would miss them if they were to change. And the term it kind of makes sense. Standard is another word for common or normal, and these are the most plain, basic plates you can get, so the word fits. So let’s get down to it. These basic plates have had a couple different designs over the years, depending on the Chinese factory casting them or the requirements of the weight equipment company that imports them. And yes, they are all made in China. This goes for nearly all other olympic plates, including precisely machined iron plates, rubber and urethane coated weight plates and solid rubber bumper plates. Only the competition grade plates like Rogue’s calibrated steel plates are an exception, and they are quite expensive in comparison. 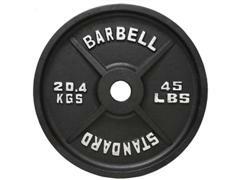 The standard olympic plates usually have the words “STANDARD” and “BARBELL” in raised lettering on their face, and a flat back side. They come in grey or black. Nowadays the finish is a baked-on enamel finish. In the old days they didn’t bother baking it on, and this is the reason so many old plates have gotten rusty, with the paint chipping away. This isn’t to say the new ones can’t rust. I stuck a small plate in a bathtub full of water (why, I can’t recall, oddly enough) and after only a few hours it had gotten rusty and I threw it out. Anyway, baking on the enamel paint hardens it into the surface, reducing the tendency to chip or flake off. It can still rusts just as quickly, but when the paint stays on better then there’s not an opening for moisture to get on the iron itself. Actually, most of the rusty plates out there right now are York, not because York doesn’t make great plates, but because York has been in the business forever. The rusty ones you come across might well be from 1950. 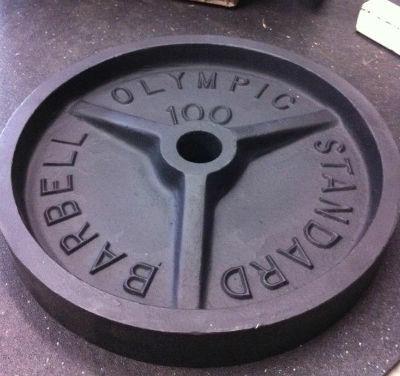 The bored hole in a standard olympic plate is a bit larger than the 2″ size of more expensive plates. More like 2 1/16″ or 2 1/8″. This is so any aberrations or inconsistencies in hole size don’t render them useless by being unable to fit over a bar sleeve. Also, cheaper bars in the past were more prone to have inconsistencies in their sleeve size as well, so the sloppily made bars went together pretty well with the sloppily made plates. Nowadays bar sleeves even on cheap bars tend to be made better, but the hole size on standard olympic plates has remained the same. So these are made to be cheap. That means the tolerances can be off. Nobody is going to be out to make cast iron weight plates as cheaply as they can and then go measuring every one to make sure it fits strict quality standards. No, they crank them out by the thousands and ship them off. The casting process is prone to inconsistencies. Iron casting is done by making a mold, pouring molten iron into it, placing the top of the mold on, and letting the iron cool. A mold only lasts so long before it has to be remade, so the next batch could come out a bit different. They try to be consistent, but things happen. This can affect both the dimensions and the weight. So for this reason, the overall size and weight isn’t guaranteed. A 45 lb plate might be 43 or 46 lbs. That’s just what you get. That’s the way iron casting is. Higher quality iron plates are also cast but are then machined down to specific sizes or to be calibrated to a specific weight. Or they just use better, more expensive casting methods, which ups the price a little, and they just toss the odd one that doesn’t conform. That way they can guarantee a 4% or 2% weight accuracy range. One reason people still go for these plates is nostalgia or because they match an existing set. If you have a whole set of these plates, it will be pretty easy to find more matches if you should get stronger or get additional weight equipment in need of plates, unlike if you get a specific brand’s design that you’ll never be able to match if that company should go out of business. That aside, they also happen to be the cheapest and most widely-available weight plates in the US today. They don’t get any more basic than this. The price alone is why they’re so popular. As well as being the most common plate, they are also the most common plates that are sold in 300 lb olympic weight sets, which include a 45 lb olympic bar and collars to hold the plates on. I was wondering if there is a quality difference between your black and silver “standard” Olympic plates. I have both, along with some vintage york plates. All of my black standard plates have a machined edge and are very uniform in size, 8 10lb plates are all within a mm our so. My silver plates very greatly in size, to the point that I keep them on my plate racks in pairs. Sorry, I didn’t notice your question until now! The black and grey are the same plates, just a different finish. The Troy premium plates have a much more consistent size.